Hans Overbeck became known in many professional qualities: merchant, linguist, ants specialist, malayologist. He was the ex-CEO / director of Behn, Meyer & Co. in Jogyakarta. Overbeck's biography is fascinating and yet another example of how successful German immigrants were in NEI. 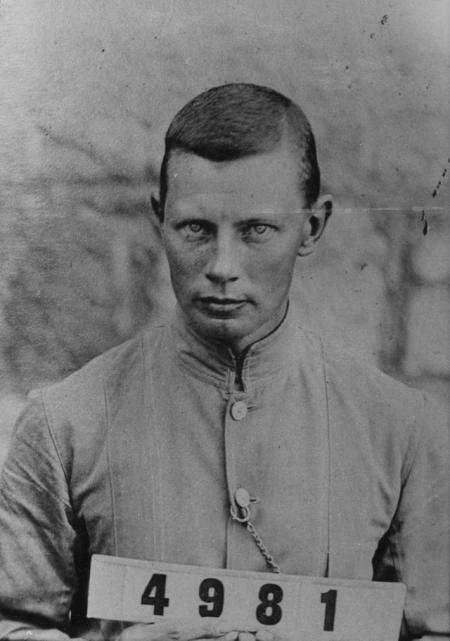 In this picture, Overbeck is seen in prison uniform following his arrival in Sydney on 17 April 1915. He was incarcerated as an enemy alien by the British authorities from 1914 to 1919. He was imprisoned in Singapore, then at Holsworthy (Liverpool) and later in the Trial Bay internment camps in Australia. This is one of only 4 known images that remained in the family. The personal effects of the Overbeck family were destroyed in Java and Bremen during WW2. Prior the First World War Hans Overbeck was a manager at the German trading house Behn Meyer and Company based in Singapore. When arrested as unwanted German in NEI, several witnesses remember that a friendship develops between Hans Overbeck and Walter Spies during their internment in Sumatra. They are both moved to the "traitors" section of the camp, traitor meaning that they openly declined the Nazi ideology. Perhaps they knew each other already from before the war. During the sinking of the Van Imhoff they distance themselves from the turmoil and sit close together, waiting and accepting their destiny.